Thread: Cinematography of 2030s: Ultra HFR! I have witnessed realtime 1000fps on real 1000Hz. #1 Cinematography of 2030s: Ultra HFR! 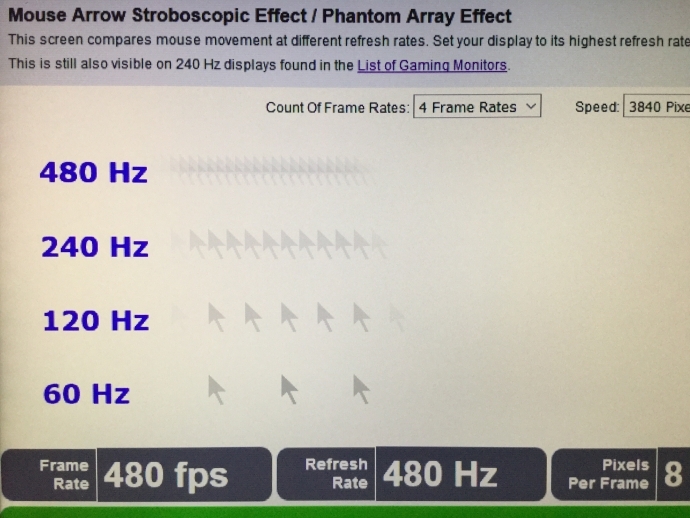 I have witnessed realtime 1000fps on real 1000Hz. Last edited by Mark Rejhon; 01-31-2018 at 02:07 PM. All I recall are the old tests that Douglas Trumbull did for his Showscan process. He felt that at really high frame rates, over 100, the ability for the audience to perceive a difference was too small to offset the practical issues of shooting and projecting at those rates. Keep in mind that 1000 fps is over a 5-stop exposure loss compared to 24 fps, though you can gain one-stop by not using a shutter at those rates. But even if it's just a 4-stop loss, your 800 ASA camera just became a 50 ASA camera. At those high rates, the screen becomes essentially flicker less and seems like a clear window, assuming there is sufficient resolution. But I also think you run into a variant of the uncanny valley phenomenon when shooting narrative fiction -- the more "real" the process becomes, the more artificial the techniques of moviemaking appear -- costumes, lighting, make-up, etc. Which is one reason why this sort of approach works better in nature documentaries, for example, because everything in front of the camera IS real. Last edited by Mark Rejhon; 01-31-2018 at 10:02 PM. Personally, I don't think you'll find a lot of support for HFR among cinematographers. Nowadays a lot of TV panels push for HFR, online players such as MEGOGO push HFR into their player by default and have no possible way to cut it off in the app. Sports channels also push for HFR. Last edited by Alex Lubensky; 02-01-2018 at 05:32 AM. Last edited by Mark Rejhon; 02-02-2018 at 01:45 PM. The ASC article on Billy Lynn's Long Halftime Walk (Dec. 2016 issue) may have some interesting information for you. Something that caught my attention was the fact that they were starting to experiment with dynamically changing the displayed frame rate in shot. Since they were starting with a HFR source, they could start a shot at "24FPS" but then when a bomb goes off, they could change to "120FPS", to give a heightened sense of realism, all without cutting. They were also talking about using masks to create "24FPS" motion blur on some sections, but "120FPS" motion blur on a different part of the frame. I could see that being a creative tool that other DP's could get behind. But I don't really see other DP's getting behind HFR for the sake of killing off motion blur completely. Yes, a seamless 120Hz change. On a related topic, there's been a concurrent development of variable refresh displays for games (G-SYNC, FreeSync) -- the same thing works with VRR-compatible video players such as SMPlayer that can transition between any infinite number of framerates (from say 30fps to 240fps of any decimal point, such as 56.12312456fps) within a display's variable refresh rate range. Variable refresh rate displays make this possible instantaneous transitions between frame rates. In theory, you could have a random-framerate video (frametimes varying 100 times a second -- every single frame having their unique frame display time) and it'd play seamlessly smooth like the demonstration animation at www.testufo.com/vrr ... But there's not much purpose in having random-length frame display times (as beautifully stutter-reduced it can become) -- it's mainly useful for 3D graphics where the time to generate frames is hugely variable -- so variable refresh rates are more useful for games. That said, the tech is useful for completely eliminating refresh-rate transitions (no mode-change blackouts) so it's useful for the 24fps -> 120fps -> 24fps HFR seamlessness too. That said, the capability built-into a display makes possible instant (seamless) refresh rate changes, which is very good for embedding HFR sequences in ordinary-framerate videos. NOTE: 120fps HFR is certainly 5x clearer (on sample-hold flickerfree -- digital projectors with no shutter), so a fairly dramatic transition from 24fps -- but still not 100% blurfree for the perfect-retina "Holodeck Experience" target capable of tricking (Star Trek Morarity style) a person into not knowing they're inside a virtual world -- that still requires quad-digit HFR (zero blur, zero stroboscopic), possibly full-focal-depth (on human eye demand) retina-resolution lightfields (so people can focus their eyes themselves), and other special techniques. I have to do a lot of testing with having a 8 to 30 fps acquisition embedded in a 60 to 240 fps distribution, the 24 fps at 180 shutter holds up amazing well in most cases. There's another thread where Michael Cioni of Panavision is talking, if you read between the lines on that there's a lot of theory going into shooting at 24 fps acquisition but distributing at much higher rates. A pretty good example of this is the moon program VR experience, where it starts off with some ancient 1960 film but your watching it in vr at a much higher fps rate. So at least for the finance guys and the high end film people, that are seeing where mobile is going and trying to provide high quality viewing experience on mobile (even RED is now in this space), they are putting a lot of energy into higher fps at least from a mobile perspective. Last edited by Mark Rejhon; 02-02-2018 at 01:42 PM. Yes for VR, yes for 3D, yes for viewfinders, on-board monitors etc. But it doesn't relate to actual world of today's cinematography overall. Once Avatar appeared on the corner - there was a lot of buzz about 3D, lots of heads were talking about destroying the world of 2D cinema and so on. Look where 3D is now, where's all the buzz? I wouldn't call VR movie a movie at all - it's a whole another story, a new page with a totally different rules of the game. I don't state it's wrong, it's just too different - from the way you create it, to the way you percieve it. Nowadays you percieve the creative vision of a whole bunch of people, and the only way you can interact as a viewer - is by using your imagination. The VR thing creates a ton of new ways to interact, and raises a lot of questions for the upcoming directors, cinematographers, editors etc. It's more like theatre, than cinema - bacause of the ways you as a viewer relate to the story. And after all, you'll still have a whole century of beautiful cinematography done in 24p and established to be viewed in 24p. Only this can last the world of 24p for another half of a century. The technology itself is a beautiful thing, but sometimes we're overhyped about it. Personally, I don't see almost any benefit of shooting HFR for viewing HFR for today's perception of the word "cinema". It is interesting, although obviously not ideal for every application. Using occasional increases in frame rate is interesting hypothetically (I did think about it once, but only as a whim, and I personally see it as a trick rather than a tool). But HFR has its applications for sure. I agree with David that it probably is best used for documentary work, if not for narrative work.